Опрацьовано результати одинадцятирічних спостережень ядра сейфертівської галактики NGC 4945 в діапазоні 3...500 кеВ з борту КА INTEGRAL. Для аналізу використано двокомпонентну модель спостережного спектру, що враховує сильне поглинання випромінювання комптонівськи-товстим тором навколо центральної машини АЯГ, і вторинне випромінювання, відбите від стінок тора. Параметри первинного спектру отриманого за весь час спостережень: нахил спектру = 1.6 ± 0.07, енергія експоненційного завалу E c=1572922 кеВ, стовпчикова густина поглинального середовища для первинного випромінювання N H, 1 = 5.0 1.00.9 1024 см–2. Стовпчикова густина поглинання для відбитого випромінювання на два порядки нижча. Рентгенівське випромінювання NGC 4945 змінюється як у потоках у смугах 20...40, 40...60 и 60... 100 кеВ, так і по формі спектру. Останнє може бути пояснене як наслідок неоднорідностей середовища, що оточує ядро. Але в той же час є ознаки того, що помірні спектральні варіації у високоенергетичному діапазоні можуть бути пов’язані зі змінами умов у «центральній машині». 1. Эфрон Б. Нетрадиционные методы многомерного статистического анализа. 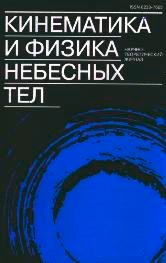 — М.:Финансы и статистика, 1988.—263 с. 2. Arnaud K. A. XSPEC: The first ten years // ASP Conf. Ser. : Astronomical Data Analysis Software and Systems V / Eds G. H. Jacoby, J. Barnes.—1996.—101.—P. 17—20. 3. Courvoisier T. J.-L., Walter R., Beckmann V., et al. The INTEGRAL Science Data Centre (ISDC) // Astron. and Astrophys.—2003.—411.—L53. 4. De Rosa A., Bassani L., Ubertini P., et al. An X-ray view of absorbed INTEGRAL AGN// Astron. and Astrophys.—2008.—483.—P. 749—758. 5. Done C., Madejski G. M., Smith D. A. NGC 4945: the brightest Seyfert 2 galaxy at 100 keV // Astron. J. Lett.—1998.—463, N 2.—P. L63. 6. Fedorova E., Beckmann V., Neronov A., Soldi S. Studying the long-time variability of the Seyfert 2 galaxy NGC 4388 with INTEGRAL and Swift // Mon. Notic. Roy. Astron. Soc.—2011.—417.—P. 1140. 7. Fedorova E. V., Zhdanov V. I. Radio quiet AGN properties vs. spin-paradigm: The case of NGC 4945 // Galaxies: Evolution, Morphology and Dynamics / Eds A. Guerrera Sanchez, R. E. Delgado Marquez. — Nova Publishers, 2012. 8. Garofalo D., Evans D. A., Sambruna R. M. The evolution of radio-loud active galactic nuclei as a function of black hole spin // Mon. Notic. Roy. Astron. Soc.—2010.— 406.—P. 975. 9. Greenhill L. J., Moran J. M., Herrnstein J. R. The distribution of H2O maser emission in the nucleus of NGC 4945 // Astron. J.—1997.—481, N 1.—L23—L26. 10. Guainazzi M., Matt G., Brandt W. N., et al. A broad-band X-ray view of NGC 4945 //Astron. and Astrophys.—2000.—356.—P. 463—474. 11. Isobe N., Kubota A., Makishima K., Ganghi P., et al. Discovery of a bright transient ultraluminous X-ray source, Suzaku J1305-4931 in NGC 4945 // Publs. Astron. Soc. Jap.—2008.—60, N Sp1.—P. S241—S250. 12. Itoh T., Done C., Makishima K., et al. Suzaku wide-band X-ray spectroscopy of the Seyfert2 AGN in NGC 4945 // Publs. Astron. Soc. Jap.—2008.—60, N Sp1.—P. S251—S261. 13. Iwasawa K., Awaki H., Yaqoob T. New horizon of X-ray astronomy. First results from ASCA // Procs Int. Conf. X-ray Astronomy, Tokyo, Japan. FSS-12 / Eds Fumiyoshi Makino, Takaya Ohashi. — Universal Academy Press Inc., 1994.—P. 581. 14. Lenc E., Tingay S. J. The sub-parsec scale radio properties of southern starburst galaxies. II. Supernova remnants, the supernova rate, and the ionised medium in the NGC 4945 starburst // Astron. J.—2009.—137.—P. 537. 15. Magdziarz P., Zdziarski A. A. Angle-dependent Compton reflection of X-rays and gamma-rays // Mon. Notic. Roy. Astron. Soc.—1995.—273.—P. 837—848. 16. Marinucci A., Risaliti G., Nardini E., et al. The unique Suzaku discovery of variability in the Compton-thick absorber in NGC 4945 // SUZAKU 2011: Exploring the X-ray Universe: Suzaku and Beyond. AIP Conf. Proc.—2012.—1427.—P. 141. 17. Marinucci A., Risaliti G., Wang J., et al. The X-ray reflector in NGC 4945: a time- and space-resolved portrait // Mon. Notic. Roy. Astron. Soc. Lett.—2012.—423.—P. L6. 18. Menzel M.-L., Beckmann V., Mattana F. Emission processes in NGC 4945 // PoSSISSA, Extreme sky 2011.—2012.—075. 19. Molina M. PhD thesis, Broad-band spectral analysis of a complete sample of type 1AGN detected by INTEGRAL // University of Southampton, School of Physics and Astronomy, Doctoral Thesis.—2009.—181 p.
20. Morrison R., McCammon D. Interstellar photoelectric absorption cross sections, 0.03—10 keV // Astron. J.—1983.—270.—P. 119—122. 21. Ricci C., Walter R., Courvoisier T. J.-L., Paltani S. Reflection in Seyfert galaxies and the unified model of AGN // Astron. and Astrophys.—2011.—532.—A102.—20 p.22. 22. Risaliti G. The BeppoSAX view of bright Compton-thin Seyfert 2 galaxies // Astron.and Astrophys.—2002.—386, N 2.—P. 379—398. 23. Risaliti G. The physical properties of X-ray absorbers in AGNs // Proc. IAU Symp.—2009.—267.—P. 119. 24. Schurch N., Roberts T., Warwick R. High-resolution X-ray imaging and spectroscopy of the core of NGC 4945 with XMM-радио and Chandra // Mon. Notic. Roy. Astron. Soc.—2002.—335.—P. 241. 25. Soldi S., Beckmann V., Bassani L., et al. INTEGRAL observations of six AGN in the Galactic Plane // Astron. and Astrophys.—2005.—444, N 2.—P. 431—441. 26. Soldi S., Beckmann V., Gehrels N., De Jong S., Lubin ’ski P. High-energy emission from NGC 5506, the brightest hard X-ray NLS1 // Proc. of the Workshop Narrow-Line Seyfert 1 Galaxies and Their Place in the Universe.—2011.—ArXiv: 1105.5993. 28. Wilson A. S., ColbertE. J. M. The difference between radio-loud and radio-quiet active galaxies // Astrophys. J.—1995.—438, N 1.—P. 62—71. 29. Yaqoob T. The nature of the Compton-thick X-ray reprocessor in NGC 4945 // Mon.Notic. Roy. Astron. Soc.—2012.—423, N 4.—P. 3360—3396.